This craft activity was a big hit in our house. Just take one suitable doll - any fashion doll is ideal. Then wrap them in a layer of white toilet paper. 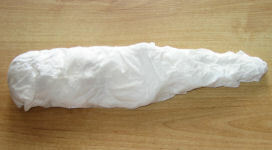 When covered spray lightly with water using a spray mister, and press the toilet paper around the doll. When dry add another layer and repeat to ensure no body bits are showing. It is not essential to spray with water but it does mean that the resulting mummy is not quite as bulky, and more satisfyingly mummified! Now make a mummy case for your fashion doll!